Oil is seen at the Durban Harbour. Pic: Southlands Sun. 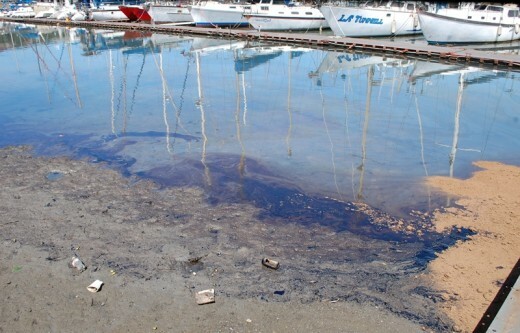 The cause of the oil spill discovered in the Durban Harbour this morning remains unknown. Authorities currently on the scene include Transnet, Spilltech and Ezemvelo KZN Wildlife, Southlands Sun reported. Yacht owner, Billy Kruger, said it would cost about R15 000 to repair the damage to each yacht, while it remains unclear what the cost would be to the wildlife in the harbour. Geese, along with fish and other birds, were seen covered in sludge this morning. Ezemvelo KwaZulu-Natal wildlife departmental spokesperson Musa Mntambo was unable to comment on the matter as no report on the oil spill had been received by the department this afternoon. This after a suspected oil slick of about 50m width was being carefully monitored off Amanzimtoti’s main beach by tourism and environmental bodies in KwaZulu-Natal earlier this month. According to Sapphire Coast Toti Tourism chairperson Jacques van Schalkwyk, they noticed the suspected slick and dispatched boats to survey the dark spill. Environmental authorities, the beach manager and harbour authorities were later notified. The suspected oil slick later dispersed in the sea, south of Inyoni Rocks, at a depth in line with the shark nets. A full report is being compiled for the benefit of department of environmental affairs, which is investigating the matter, South Coast Sun reported.